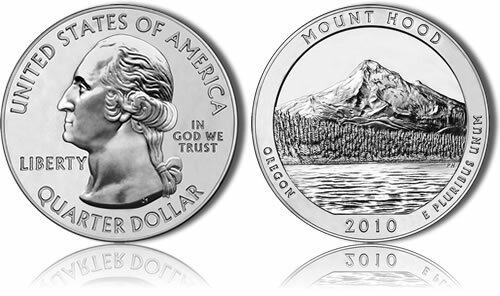 The Mount Hood National Forest Silver Uncirculated Coin honors Mount Hood National Forest of Oregon. It is the last of five 2010-dated five ounce silver collector grade pieces for release. Despite its date, the silver uncirculated coin was only issued on July 28, 2011. The silver uncirculated coin is a collector version of the companion investor grade bullion coin already released in US Mint’s America the Beautiful Silver Bullion Coins Program. The two five ounce silver coin series, along with the circulating America the Beautiful Quarters®, all honor selected sites of national interest from around the United States and its territories. Initial production difficulties by the Mint for these uncirculated coins and the related bullion coins forced a delay in the releases of both series. The 2010 bullion series (which saw a mintage of 33,000 of each of the five 2010–dated bullion coins) only launched in December of 2010 which led the Mint to delay the release of these collector grade versions until 2011. The 2010-dated uncirculated coins featured a mintage of 27,000 per strike. All three programs (bullion, uncirculated and quarter) contain a portrait of George Washington on their obverse as designed originally by John Flanagan. This portrait was first featured on the circulating quarter dollar in 1932 and has been seen on the quarter in one form or another ever since. Also shown are the inscriptions of UNITED STATES OF AMERICA, LIBERTY, IN GOD WE TRUST and QUARTER DOLLAR. An image of Mount Hood with Lost Lake shown in the foreground is included on the reverse of the silver uncirculated coin along with the inscriptions of Mount Hood, Oregon, 2010 and E PLURIBUS UNUM. Mount Hood National Forest takes its name from the massive volcano found within the park’s boundaries. The mountain itself was named after British Admiral Samuel Hood in 1792. However, the Native Americans of the region had known it as Wy’east for centuries before that. The national forest received its current name and status in 1924, however it was known as Oregon National Forest for sixteen years before that. It consists of over 1 million acres and receives over 4 million annual visitors. A large reason for so many visitors is the fact that the forest is located only an hour’s drive from the large city of Portland, Oregon.